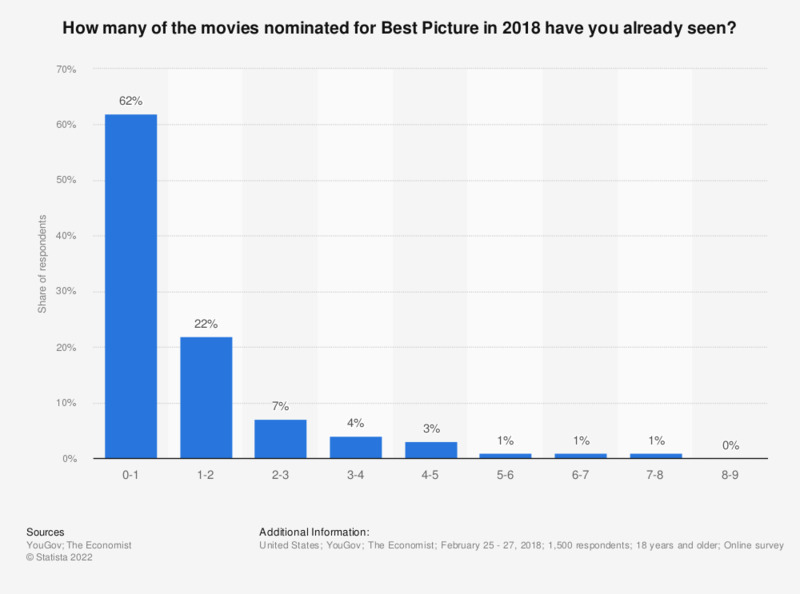 The statistic presents data on the number of movies nominated for the Academy Award for Best Picture in 2018 consumers have seen in the United States as of February 2018. During a survey, 22 percent of respondents stated they had seen one to two movies nominated for Best Picture in 2018. Have you seen, want to see, or at least heard of “Call Me by Your Name”? Have you seen, want to see, or at least heard of “Dunkirk”? Have you seen, want to see, or at least heard of “Mudbound”? Have you seen, want to see, or at least heard of “Lady Bird”? Have you seen, want to see, or at least heard of “Roman J. Israel, Esq.”? Have you seen, want to see, or at least heard of “Phantom Thread”?